Our lawyers are experienced litigators who have backgrounds in litigation for both personal injury claimants and insurance carriers. Our attorneys now work strictly for personal injury claimants, however our insurance defense experience has given us the insight and knowledge about how insurance adjusters evaluate and settle personal injury cases. Our lawyers have tried and won very difficult cases, resulting in six, seven and even eight-figure settlements for our clients. We believe in keeping a narrow focus on handling personal injury claims only. Our lawyers do not draft wills, trusts, handle criminal cases or family law. We believe that serious injuries deserve superior results. While we enjoy trial work, many of our most successful case results are ones that have settled outside of court as a result of our thorough preparation, our selection of top notch experts, and our intuitive presentation of claim documentation during negotiations toward settlement. Each and every personal injury case requires and deserves careful attention, commitment of resources, and dedicated, professional skill. We take the time to explain every step of the process to our clients so that the choices they make about their cases and their futures are well informed. When you hire the law firm of Link & Smith, P.C. we strive to maintain contact between the lawyer and the client. Our lawyers are accessible for your every need and we take client calls directly. 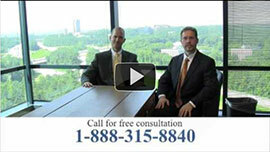 Whenever you need to speak with one of our attorneys we are just a phone call or email away. For a free confidential consultation and information on how we can put our years of experience to work for you, call us at 404-315-8840 or contact us via email. Discover how we earned our reputation for legal excellence and our track record of success. We Are Committed to Providing Outstanding Results For Our Clients.